I recently added the Ruched Boutique banner to my blog. 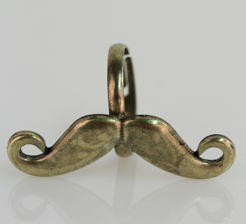 Loving all of their merchandise but especially this mustache ring! I've become a little obsessed with the mustache craze!! If you follow me on pinterest you may have noticed all of the wonderful mustache items I have found over the net! Check out their sweet boutique from accessories to apparel!! All of my readers receive an additional 10% off their already low prices. Use promotional code beans at checkout! Offer valid until Wednesday!